If choosing the CUSTOM name option, please put your personalization in this box before checkout. Thanks! Beautiful glazes of Pink, Lavender, Purple, Fuchsia & Aqua Turquoise on a unique gift she can keep forever! And the gold color letters make it even more special! 🎀 Notice SIZE: Measures about 3 1/2 inches wide, 2 1/2 inches top to bottom. Unglazed on back & my stamp. Name is enhanced with gold color. I also added a little glitter, for more interest! Hangs by silvery hanging cord. Ready made with some names or set drop-down on CUSTOM and I'll make your chosen name! 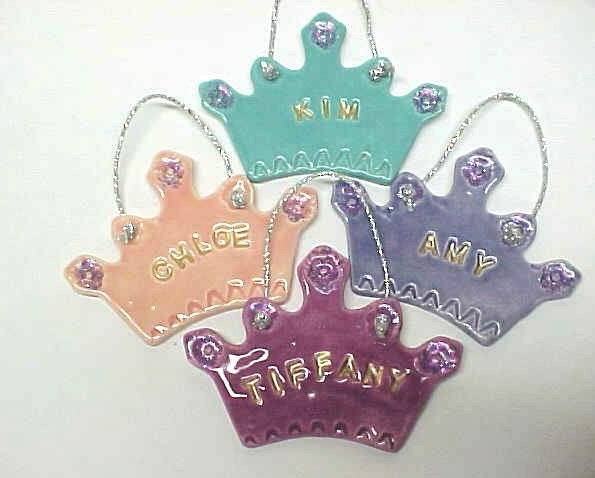 If you need MULTIPLES of them for Personalized Party Favors, for example, please contact me!